Comm Eye Health Vol. 30 No. 100 2018 pp 107. Published online 07 February 2018. 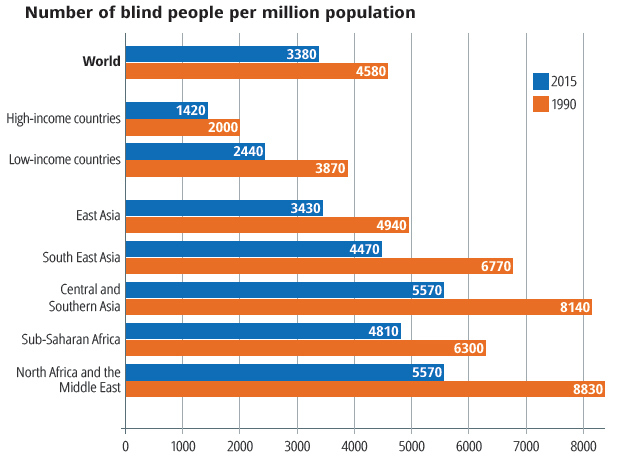 The chart below shows the number of blind people per million population for the world, and different regions, between 1990 and 2015. 1. What two trends are shown in the figure? 2. What is the ratio of blindness in 2015 between sub-Saharan African countries and high-income countries? 3. Why do low-income countries have more blindness per million population than high-income countries? 4. Why might you expect high-income countries to have more blindness per million population than low-income countries?